Two Saturdays ago, I was very privileged and lucky to be one of the 50-odd participants selected to attend the first ever Food & Socialikes Connect 2015! It's a conference for food bloggers and food Instagrammers, to share knowledge and discuss about issues relating to the food and social media scene in Singapore. Just a heads-up before you continue reading, this post is going to be quite personal as I left the conference with a whole head full of thoughts...! Very soon, it was time for lunch! Grabbed this refreshing albeit sweet lemonade, courtesy of one of the sponsors, Cold Front Co. along with my food. And of course, meal times are such a significant one for foodies, and amplified even more when you're in a room with more than 50 of us! xD We had a food photography competition, to see who can make this Nasi Lemak bento (sponsored by Soon Huat) into something much more delectable and appetising than it already is! My first thought: it's so crowded here and there's no good spot to take photos, plus the lighting isn't the best you can find around... AND it's a bento some more, not like there's a nice plating etc... But of course, most people starting moving about and being very serious on the photography, so I decided to try too haha. All I can say is, I tried. Hahaha, it's not as easy as you think. I submitted the above photo in the end, because I was getting a bit frustrated at my lack of creativity/amateurish shots sigh. After lunch we had two panel discussions. The first consisted of food blogger Maureen Ow (misstamchiak), Willin Low (chef-owner of Wild Rocket), and Dylan Ong and Joshua Khoo (chef-owners of the Saveur Group). They discussed about the impact of social media on restaurants. Even though it didn't have direct relation to me, one thing I remember from this panel discussion is the importance of restaurants recognising their identity. In other words, it's crucial for them to know if they're a male or female, and how old they are. This is so that they can market themselves to the right people, especially for people to invite for media tasting etc. The second panel was about the rights and plagiarism of social media users, and saw the likes of Maureen, lawyer-turned-food blogger Beatrice (The Hungry Bunny), fellow food blogger Catherine (Camemberu) and Daniel (DanielFoodDiary) leading the discussion. Cases of plagiarism seem to be increasing lately, and I've noticed a bit on Instagram too. At first I didn't think it was a super big issue, i.e. worth going to the courts over, but I think that's because I'm not popular/famous enough to have my articles/pictures plagiarised LOL. But ok jokes aside, I do feel that plagiarism is a big no-no, not just in the food blogging scene but in anything in life. I definitely do not want people taking my work/pictures and claiming it their own without giving proper credits and acknowledgement! This panel discussion made me realise the severity and weight of it all, in the sphere of food blogging and food Instagramming. Now this was one of my favourite parts of the conference! The second talk of the day is about life and blogging, delivered by none other than Dr Leslie Tay (ieatishootipost) himself! I've always admired how he can juggle his full-time job as a General Practitioner, be a familyman and manage his foodie life too! Needless to say, he spoke about some tips for blogging that can also be applied to life in general as well. My most memorable takeaway from his sharing was that you have to begin with an end in mind. When you start a food blog, what is your end goal? Looking beyond just blogging, what is your goal in life? For whatever journey you set out to embark, what do you want to achieve at the end of the day? These were the questions that he asked and got me thinking very hard. Do I just want to be a novice food blogger with posts reaching out to only a few people? Or is my aim to make a living through my food blog? Well... To know the answers, you can find out more at the end of my post! The next talk was given by Hoong An, the founder of HungryGoWhere. He spoke about the past and present trends of social media and food, and I found it highly relevant! I mean, okay, that's why this conference is organised right? Haha but yeah, it's good to hear it from the guy who witnessed all and went through it right from the beginning in 2006 till now. Then came tea break which also means the second food photography competition! Hahaha, I gave up taking photogenic shots of the food. Plus these were my favourites - cheesecake and pecans and melon and digestive biscuits base so I was eager to try them! :D Thanks to the The Palette Knife for these lovely desserts! And with that, the first FSC 2015 has come to an end! 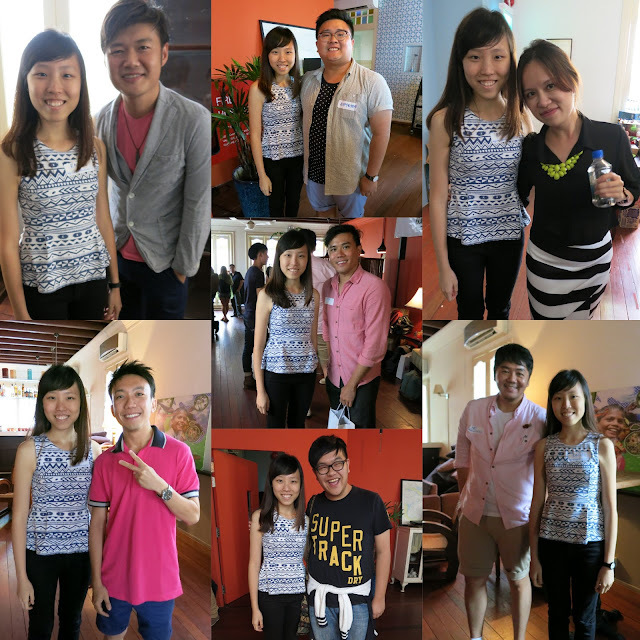 It was a very successful event and much kudos to the organisers Aries Ong (@ironsage), Nicole Poi (pinkypiggu), A. Nathanael Ho (Rubbish Eat Rubbish Grow), Derrick Tan (SG Food on Foot) and Nicholas Tan (@stormscape) for bringing the foodie community together to discuss about serious stuff (aside from the usual food tastings/catch up over meals)! It's definitely good that there's some recognition given to people like us who aim to bring Singapore's food scene to the next level! Hmm, I just thought that perhaps we could have some kind of introduction for everybody before launching into the event proper? Like maybe get every participant to introduce themselves and their Instagram handle, so that we can all put a face to the account that we've been following haha (at least for me). It also makes things easier for us to approach a person later on when we mingle around! One more thing, while I appreciate that the organisers kept to the programme timeline very well, e.g. starting every segment on time, I think maybe some leeway can be allowed? For example, Dr Leslie Tay's talk was kinda hurried partly because he was reaching the end of his allocated and also that he prepared too many slides haha. But I wished we could have him share for a while longer, because I really enjoyed his presentation! It got me thinking real hard, what must I do to become as accomplished as them? Going back to what Dr Leslie Tay said, what is your end in mind? I definitely don't aim to be so renowned that I can make a living from my food blog, but... I've been blogging for more than a year now (well, not including my old personal blog from 2008). And one year is actually more than enough time to get your name around. When I look back, I know I haven't been putting a lot of effort into this blog, because like it or not, I'm a full-time student and with that comes the big commitment of studies and other school stuff as well. So then I ask myself, what is my priority in life? Given that I have other interests such as travelling, baking, exercising, and even dancing, what do I want to achieve in life? It triggered a whole wave of questions and demanded some soul-searching in me. Yay you've made it to the end of my post! Thank you so much for reading!